These are projects from EQ Artists, popular designers, authors and other EQ users! This quilt was designed by Christa Watson using her Fandangle fabric collection by Benartex. Download the EQ8 project file and get the free PDF pattern download directly from Christa! EQ user, Jo Moury, designed and made this gorgeous quilt and has offered to share her sewing instructions! 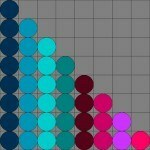 Download the EQ8 project and the PDF for her instructions. Check out her finished quilt in the EQ Quilt Gallery! EQ user Jean Spero has designed Calendar Placemats! She has also designed Calendar Quilts! 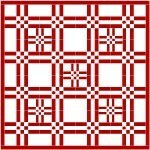 Abacus is a modern wallhanging which features easy machine applique and simple but effective machine quilting. You can make it in your choice of colors and fabrics. 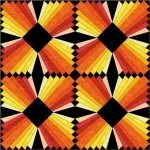 Our newest EQ Artist, Angela Pingel, created this quilt for EQ7 users! 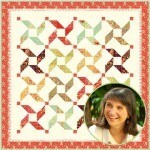 Check out her profile and her new book about curved piecing! 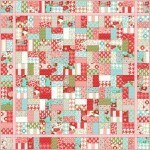 Theresa Litz designed “Quilt Neighbors,” creating homes for her guild challenge’s already sewn modified 9-patch blocks. June’s Club EQ Challenge brought in so many cute designs like this one! 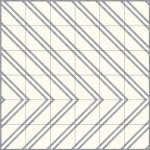 Download Barbara Gilstad’s project for FREE now! Mrs. Goodneedle of from Strawberry Patch Quiltworks has a fun and easy project for you! Joanna Figueroa of Fig Tree & Co. designed a project for all of our EQ7 users using a charm pack of her very own Tapestry collection! Use Joanna’s fabrics or get creative with some of your favorite charms! This sugary sweet Jolly Jelly Roll Quilt was my very first quilt along! Made from just one jelly roll and a yard of fabric, this easy quilt goes together very quickly. A fun mini quilt for the holidays! Christa’s Parallel Lines Block was chosen as a finalist in the Modern Quilts Unlimited Fresh Ideas block challenge. 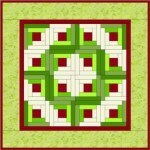 Check out her quilt design using the block! Is it the front of the quilt, or the back? You get to choose with this fun and colorful modern design! Use your favorite scraps to whip up a holiday quilt in a hurry! 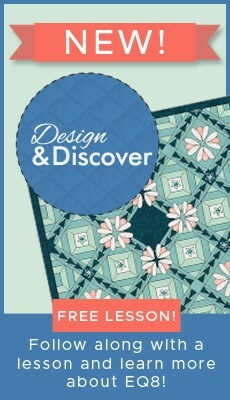 Inspired by Deb Strain’s Seascapes, this easy to piece design is fun to quilt!